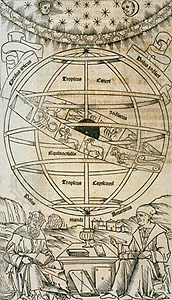 Ptolemy and Regiomontanus shown on the frontispiece to Regiomontanus' Epitome of the Almagest, 1496. The Epitome was one of the most important Renaissance sources on ancient astronomy. Ptolemy, Latin in full Claudius Ptolemaeus (fl. AD 127-145, Alexandria), ancient astronomer, geographer, and mathematician who considered the Earth the center of the universe (the "Ptolemaic system"). Virtually nothing is known about his life. Ptolemy's astronomical work was enshrined in his great book He mathematike syntaxis ("The Mathematical Collection"), which eventually became known as Ho megas astronomos ("The Great Astronomer"). During the 9th century, however, Arab astronomers used the Greek superlative Megiste to refer to the book. When the definite article al was prefixed to the term, its title then became known as the Almagest, the name still used today. The Almagest is divided into 13 books, each of which deals with certain astronomical concepts pertaining to stars and to objects in the solar system (the Earth and all other celestial bodies that revolve around the Sun). It was, no doubt, the encyclopaedic nature of the work that made the Almagest so useful to later astronomers and that gave the views contained in it so profound an influence. In essence, it is a synthesis of the results obtained by Greek astronomy; it is also the major source of knowledge about the work of Hipparchus, most probably the greatest astronomer of antiquity. Although it is often difficult to determine which findings in the book are those of Ptolemy and which are those of Hipparchus, Ptolemy did extend some of the work of Hipparchus through his own observations, apparently using somewhat similar instruments. For example, whereas Hipparchus had compiled a star catalog (the first of its kind) containing 850 stars, Ptolemy expanded the number in his own catalog to 1,022 stars. On the motions of the Sun, Moon, and planets, Ptolemy again extended the observations and conclusions of Hipparchus--this time to formulate his geocentric theory, which is popularly known as the Ptolemaic system. (See Ptolemy's theory of the solar system.) In the first book of the Almagest, Ptolemy describes his geocentric system and gives various arguments to prove that, in its position at the center of the universe, the Earth must be immovable. Not least, he showed that if the Earth moved, as some earlier philosophers had suggested, then certain phenomena should in consequence be observed. In particular, Ptolemy argued that since all bodies fall to the center of the universe, the Earth must be fixed there at the center, otherwise falling objects would not be seen to drop toward the center of the Earth. Again, if the Earth rotated once every 24 hours, a body thrown vertically upward should not fall back to the same place, as it was seen to do. Ptolemy was able to demonstrate, however, that no contrary observations had ever been obtained. As a result of such arguments, the geocentric system became dogmatically asserted in Western Christendom until the 15th century, when it was supplanted by the heliocentric (Sun-centered) system of Nicolaus Copernicus (q.v. ), a Polish astronomer. Ptolemy accepted the following order for celestial objects in the solar system: Earth (center), Moon, Mercury, Venus, Sun, Mars, Jupiter, and Saturn. He realized, as had Hipparchus, that the inequalities in the motions of these heavenly bodies necessitated either a system of deferents and epicycles or one of movable eccentrics (both systems devised by Apollonius of Perga, the Greek geometer of the 3rd century BC) in order to account for their movements in terms of uniform circular motion. In the Ptolemaic system, deferents were large circles centered on the Earth, and epicycles were small circles whose centers moved around the circumferences of the deferents. The Sun, Moon, and planets moved around the circumference of their own epicycles. In the movable eccentric, there was one circle; this was centered on a point displaced from the Earth, with the planet moving around the circumference. These were mathematically equivalent schemes. Even with these, all observed planetary phenomena still could not be fully taken into account. Ptolemy therefore exhibited brilliant ingenuity by introducing still another concept. He supposed that the Earth was located a short distance from the center of the deferent for each planet and that the center of the planet's deferent and the epicycle described uniform circular motion around what he called the equant, which was an imaginary point that he placed on the diameter of the deferent but at a position opposite to that of the Earth from the center of the deferent--i.e., the center of the deferent was between the Earth and the equant. He further supposed that the distance from the Earth to the center of the deferent was equal to the distance from the center of the deferent to the equant. With this hypothesis, Ptolemy could better account for many observed planetary phenomena. In the Ptolemaic system, the plane of the ecliptic is that of the Sun's apparent annual path among the stars. The planes of the deferents of the planets were believed to be inclined at small angles to the plane of the ecliptic, while the planes of their epicycles were inclined by equal amounts to those of the deferents, so that the planes of the epicycles would always parallel that of the ecliptic. The planes of the deferents of Mercury and Venus were assumed to oscillate above and below the plane of the ecliptic, and likewise the planes of their epicycles were thought to oscillate with respect to the planes of the deferents. All this was necessary to explain retrograde motion, the apparent backwards track of the outer planets against the background of stars. Although Ptolemy realized that the planets were much closer to the Earth than the "fixed" stars, he seems to have believed in the physical existence of crystalline spheres, to which the heavenly bodies were said to be attached. Outside the sphere of the fixed stars, Ptolemy proposed other spheres, ending with the primum mobile ("prime mover"), which provided the motive power for the remaining spheres that constituted his conception of the universe. As a geometrician of the first order, Ptolemy performed important work in mathematics. He devised new geometrical proofs and theorems; and, in a book entitled Analemma (Greek Peri analemmatos; Latin De analemmate), he discussed the details of the projection of points on the celestial sphere (an imaginary sphere extending outward from the Earth for an infinite distance and on whose surface the objects in space appear to be located) onto three planes at right angles (90) to each other--the horizon, the meridian, and the prime vertical. In another book, the Planisphaerium, Ptolemy is concerned with stereographic projection--the delineation of the forms of solid bodies on a plane--and here he used the south celestial pole as his center of projection. Ptolemy also prepared a calendar that gave, in addition to weather indications, the risings and settings of the stars in the morning and evening twilight. Other mathematical publications include a work, in two books, entitled Hypotheseis ton planomenon ("Planetary Hypothesis") and two separate geometrical works, one of which is concerned with proving that there cannot be more than three dimensions of space; the other contains an attempted proof for a postulate on parallel lines that had been devised by Euclid. According to one authority, Ptolemy wrote three books on mechanics; another authority, however, credits him with only one mechanical work, Peri ropon ("On Balancing"). Ptolemy's work on optical phenomena appeared in Optica, the original edition of which consisted of five books. In the last book, he deals with a theory of refraction (the change in direction of light and other energy waves when they pass obliquely from a medium of one density into a medium of different density), and he discusses the refraction suffered by light from celestial bodies at various altitudes. This is the first recorded attempt at a solution of this observational problem. Ptolemy also wrote a three-book treatise on music known as the Harmonica. As a geographer, Ptolemy's reputation rests mainly on his Geographike hyphegesis (Guide to Geography), which was divided into eight books; it included information on how to construct maps and lists of places in Europe, Africa, and Asia tabulated according to latitude and longitude. There were, however, many errors in the Guide--e.g., the Equator was placed too far north, and the value used for the circumference of the Earth was nearly 30 percent less than a more accurate value that had already been determined--as well as some contradictions between the text and maps. Moreover, as a whole, the Guide cannot be considered "good geography"; it does not mention anything about the climate, natural products, inhabitants, or peculiar features of the countries with which it deals, and Ptolemy's treatment of the geographical importance of such factors as rivers and mountain ranges is careless and of little use. In spite of its faults, the Guide is an important work from a historical point of view because, like the Almagest, it exerted a great influence on later generations. Christopher Columbus, for example, used it to strengthen his belief that Asia could be reached by travelling westward because Ptolemy had indicated that Asia extended much farther east than it actually does. Even as late as 1775, it was believed that the Indian Ocean was bounded by a southern continent, as Ptolemy had suggested; the return voyage from the Southern Hemisphere of Capt. James Cook in July of that year proved otherwise.